Missing teeth affect a person’s appearance, the ability to speak and chew, and dental and overall health. Many people who have lost teeth desire new teeth that are attractive, natural and comfortable. Others, who have worn removable bridges or dentures, wish to have the security of fixed (stationary) teeth. Dental implants have made this possible. Over the last 30 years, dental implants have grown to be an effective and reliable means of replacing missing teeth and securing bridges and dentures. In expert hands, it is a highly successful technique that has improved the quality of life for many people. Convenience. Dental implants eliminate the embarrassing inconvenience of removing your dentures, as well as the need for messy adhesives to keep your dentures in place. A dental implant has two main components: an anchor (a small man-made root) which is placed in the jaw bone (the implant itself), and the custom-made tooth (or teeth) which is attached to it. Dr. Cirka, Dr. Meier, Dr. Jeon or Dr. Smith restore the teeth above the gum, and a trusted colleague of his, Dr. Stephen Brown, places the actual implant. For proper planning, you will meet with Dr. Cirka, Dr. Meier, Dr. Jeon or Dr. Smith and Dr. Brown, who function as a team, in planning your implant. In the first phase, the implant itself is placed under the gum in the bone. This procedure is done comfortably. Local anesthetics, like Novacaine, are all that is required. There is no sensation that an implant is present – it becomes a completely accepted part of the body without danger of rejection. Often, Dr. Cirka, Dr. Meier, Dr. Jeon and Dr. Smith will replace the missing teeth on a temporary basis prior to or shortly after the implants are placed. A period of 12 weeks or more is generally used to allow the bone to adapt to and secure the implant. After this period, the teeth or bridge will be made by the laboratory and Dr. Cirka, Dr. Meier, Dr. Jeon or Dr. Smith will secure them to the implants. Once the teeth are in place, you will have follow-up appointments with Dr. Cirka, Dr. Meier, Dr. Jeon or Dr. Smith as needed for regular dental cleanings on the implant is treated like a natural tooth. 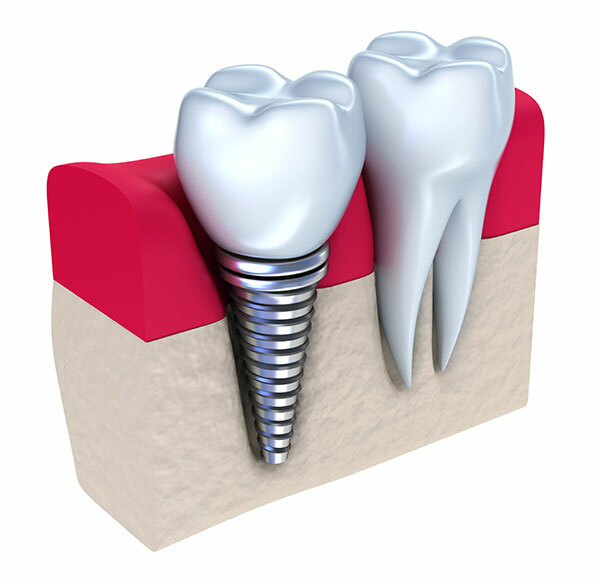 Anyone with a missing tooth can be considered for dental implants. Age is not a consideration in implants. They have been successfully placed in young people as well as persons of very advanced age. A thorough assessment is necessary before beginning the process. This will include a complete medical history, an exam, x-rays, impressions (molds) of the teeth and gums, and usually a CT scan (a three-dimensional computerized x-ray for precision placement of your implant). After a careful evaluation, Dr. Cirka, Dr. Meier, Dr. Jeon, Dr. Smith or Dr. Brown (the gum doctor, or periodontist, we work with) will discuss the number and type of implants that would be best for your particular situation. Options for tooth replacement other than implants will also be presented. Good oral hygiene and a commitment to regular dental checkups are critical to the long-term success of dental implants. With the proven techniques and materials available today, the teamwork of Dr. Cirka, Dr. Meier, Dr. Jeon, Dr. Smith and Dr. Brown, and proper follow-up care, implants often outlast natural teeth. All surgical procedures hold some potential for complications. Implant surgery is generally considered a minor procedure of relatively low risk. Minor complications may occur which require additional treatment to correct. Please contact us for any information you need in deciding about implants to replace missing teeth. We are here to help you.